Stay at Our Hotel's Property in Totowa, New JerseyIdeally situated just 12 miles from NYC and near the junction of Routes 80, 46 and 23, our Totowa hotel's location provides guests with easy access to all this area has to offer. 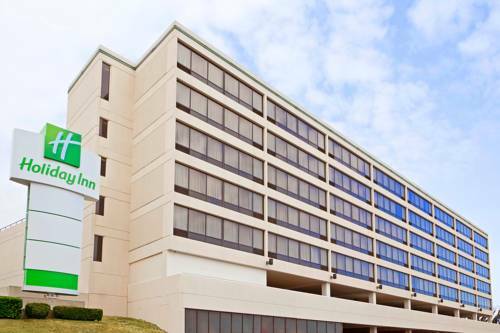 Whether you want to be close to Broadway, Newark Airport or the Meadowlands, the Holiday Inn Totowa Wayne hotel is the place for you.When it comes to meeting the needs of corporate travelers, we offer amenities like a 24-hour Business Center with print and copy services and more than 7,000 square feet of meeting space with seven different room combinations. In addition, our hotel's near NYC and Newark International Airport (EWR), making it easy for you to move in and out of the city with ease.Leisure patrons love our hotel's location near NYC because it provides close proximity to all the best attractions, such as the New York theatre district and several sports complexes. Enjoy activities like cheering at a game at Giants Stadium, seeing a show on Broadway or shopping at Willowbrook Mall. There are also several wonderful restaurants nearby.If you would rather stay around the hotel, take a dip in the pool or enjoy a delicious meal at Ruby Lounge. When you stay with us in Totowa, our hotel's property provides you with a variety of great amenities, such as a Fitness Center and free high-speed, wireless Internet access throughout the entire facility. Call today to reserve your room! newly renovated restaurant lounge, casual atmosphere featuring continental and daily specials. homemade soup, steaks, salads, pastas, chicken, burgers, sandwiches and appetizers. If you're in the mood for a good time, head to Ruby Lounge. Located adjacent to the lobby, this happening establishment features cool perks, such as a live DJ, live bands, a great sound system and a huge dance floor. Dance the night away at Ruby Lounge. Newly renovated rooms of 3,000 square feet to accommodate you for social and corporate events. Ballroom can be divided into 3 separate rooms for multi-use. AV Equipment available for all your needs. Newly renovated banquet space of 1800 square feet, for social and coporate events, AV Equipment available for your events. Rooms can be divided into 2 separate space for your event. OVER 100 RETAIL STORES AND RESTAURANTS, FOOD COURT. MACY'S, LORD & TAYLORS, BLOOMINGDALES, JCPENNEY, SEARS, MANY OTHER SPECIALITY STORES FOR YOUR SHOPPING CONVENIENCE.